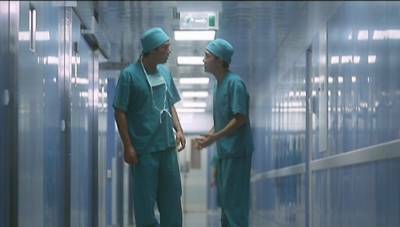 Healing Hearts is a Hong Kong hospital drama, focussing on the lives of a few doctors and patients. One of the biggest selling points for the film has to be the cast involved. While I've only listed the three main stars in the specs above, there are also appearances from Pinky Cheung, Stephen Fung and Valerie Chow to name a few other big names. I've read that this was actually filmed as the pilot for a new TV series, which may explain quite a bit concerning the plot. 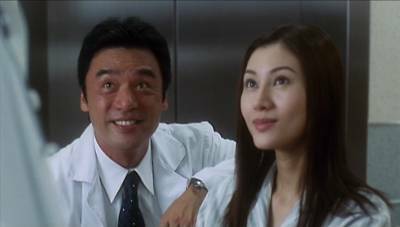 The main story in Healing Hearts is about a woman called Jackie (Michelle Reis), and the two doctors in her life. She had been in a coma for quite a while, and was cared for and looked after by a doctor called Paul (Kenny Bee). During the time she was in the coma, he had grown affections towards her, and frequently went to see her and talk to her when he was off duty. In his visits to her, he had managed to convince himself that he was in love with her, and that when she awakens from her coma she will return his feelings. 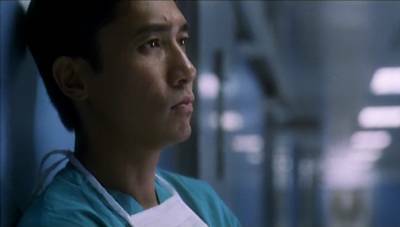 Paul's best friend, Lawrence (Tony Leung Chiu Wai), is also a doctor at the same hospital, and knows of Paul's feelings towards Jackie. One day when he is trying to avoid the senior managerment of the hospital, he uses Jackie's room as a hiding place. As he is leaving, though, he notices something has changed - Jackie had moved. Upon awakening from her coma, Jackie believes that Lawrence had something to do it, and as such is incredibly grateful towards him. With her now being awake, Paul continues to look after and nurses her back to health, but Jackie explains to him that while she is very grateful for everthing he has done for her, nothing is going to happen beyond that between them. No longer having to stay in the hospital, Jackie goes in search of somewhere cheap to live until she finds herself a job and can afford somewhere decent. While out looking for somewhere Lawrence sees her and comes to her aid, offering her a stay at his place for short a time. Lawrence had pretty much given up on relationships since the day his girlfriend was killed in a hit-and-run accident, and he had yet to move on in mind or lifestyle. However, during their time living together, Jackie has a serious affect on Lawrence's houselife and routine, and within a short while he starts to develop feelings towards her, and wants her short stay at his place to continue. That is the main story in Healing Hearts, but there are several other sub-stories involving the other cast members. Where they differ to the main story between Lawrence and Jackie is that they are not complete. Characters just seem to appear, and there is a little bit of a story or incident with them, that seems irrelevant to the film, and this story is neither developed nor explained. Stephen Fung's character is a young doctor undergoing a crisis of conscience over what he should say to an enquiries commitee, and Valerie Chow is a lawyer who you are lead to believe possibly has a jaded past involving some triad members. My only guess is that while their stories are only touched upon and barely explained in this film, they will go on to be the main focus points of the TV series for which this film is the pilot. If that is not the case, then the people behind this film should really have taken a look at the film before releasing it! While the main story is a romantic tale between the two, there is still all the more real life issues happening at the same time. There are surgeries that must take place, there are patients who don't always survive, and then there are relatives that hold the doctors responsible for not saving them. With the doctors there is the harrassing management, internal relationships between staff members, and struggles in their own life. Acting wise, there are only really two people worth commenting on, and that is due to the fact that they have the vast majority of the screen time, not that everyone else in the film was terrible - which they weren't! 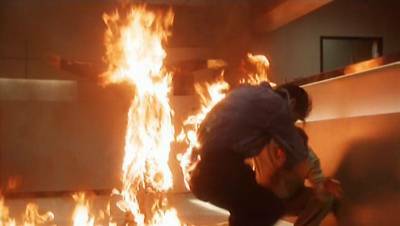 Tony Leung Chiu Wai, again shows why he is one of the better actors around in Hong Kong cinema. His portrayal of Lawrence struggling to get over the death of his girlfriend, is of a very high standard. You can see the difficulties his character is going through in trying to adjust to the changes made with the presence of Jackie. Slowly, from being desensitised to most things, emotions start appearing in his character. 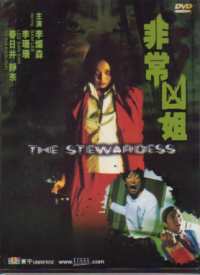 Michelle Reis, while not always known for her acting abilites, also gives a good performance here. In her hands, you can see Jackie as being the optimistic woman that she is. Despite the crap hand she has been dealt in life, she does her best to remain upbeat, and Michelle clearly gets these feelings across. All in all the acting is of a good standard. All in all you've got a rather disjointed film in Healing Hearts. The main story is full of emotion and runs its course, but none of the other characters in the film have such a conclusion. They are introduced, and some information and slight progression of a story/relationship is shown, but then it never resurfaces. This does ruin the film, as I found myself asking at the end, "So who was he/she, and what was going on with him/her?" I guess I'd have to watch the resulting TV series to find out. However, there was one common theme that ran through several of the plot and sub-plot lines, and that was that for some people some things are better not known. The Cantonese audio track in Healing Hearts is a mono track as far as I could tell. I listened to the first 5-10 minutes of the film using my 5.1 set-up, but all sounds and speech came from front centre. In cases like that where all sounds are going to come from that one speaker, I prefer to use my TV's speakers instead of the single front centre one. There was really nothing that special about the sound track. All speech was clear enough, although at times there did sound like there was a slight "tinny" echo to some of the speech and effects. Other than that, nothing much worse mentioning. The subtitles, on the whole, were good. They were the usual removable style - bold white font with a black border for each letter, positioned over the film print. There were very few spelling or grammar errors, which was good, however they did suffer from something I've not seen occur anywhere else before. On quite a few instances in the film instead of translating what was being spoken the subs just wrote something like "#NAME?". I don't know if this was someone in the film's name which the person writing the subtitles wasn't able to hear properly, so wrote this instead with the intention of coming back to fix it, or something else entirely. Whatever the reason, it is quite annoying seeing that on screen and not knowing what it should say instead. 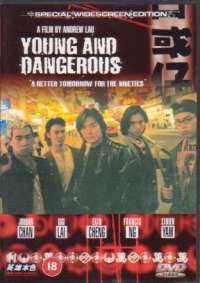 The film is presented in a letterboxed format. There is a little amount of speckling throughout the entire film, but not enough to be that off-putting. The print generally appears quite soft as there doesn't seem like there is a great amount of fine detail in any shot. Colours are reproduced pretty well, not looking too bright or too pale. I wasn't aware of much grain at all while watching, so if it is there, it is not that noticable. The Healing Hearts DVD comes with a Chinese only menu screen, from which you just have to figure out what the options are (if you can't read Chinese that is!). To save you the effort, here is what I've figured out. There are four options on the main menu screen, the top one is to start the film, second top is the chapter selection option, second bottom is the audio and subtitles option, and the last one is the theatrical trailer. The sub-menu for the audio and subtitles is also only in Chinese, but you don't really need to worry about that at all, as it is easier to just start the film, use the audio button on your dvd remote to select your preferred language setting, and the subtitle button to change subtitle options. Anyway, just the film's trailer for an extra... not much at all. Overall Healing Hearts is a decent enough romantic drama, I guess, as long as you just focus your criticism on the main story between Jackie and Lawrence. The other stories must only be there to set the scene for the TV series, so if you ever plan to watch it, you might well be filled in better than you are in the film. But, if you have no intention of watching the TV series, like me, then the unfinished stories, plots and characters that seem to have served very little purpose, are all exactly that - unfinished and therefore unsatisfying. Anyway, the acting is good enough, and the main story interesting enough to give you some soppy entertainment if romantic dramas are your cup of tea.